CCTV surveys of drains, pipes, and sewers provide our engineer and yourself with an accurate assessment and therefore the most cost effective way to repair the drainage problems. Our dedicated CCTV crew can trace and locate existing drainage and mark out. We can also carry out a camera survey of the existing drainage to see if it is suitable to use/repair or if it is cheaper to abandon it. Sometimes, nothing less than a visual assessment of the offending pipe will identify drainage issues. On these occasions, CCTV cameras are sent down the drain to provide both you and our engineer with a full insight of the drainage condition on a television screen installed on all of our vehicles. 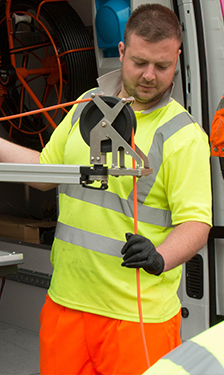 CCTV surveys of drains, pipes, and sewers provide our engineer and yourself with an accurate assessment and therefore the most cost effective way to repair the drainage problems.